Dirty dishes are an inevitable part of life. Creating a daily dishwashing routine can help save time and reduce hassles and mess. 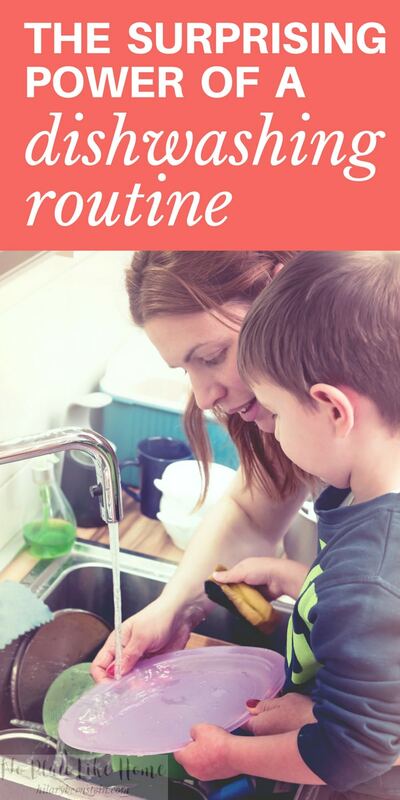 As a homeschooling, work-at-home mom of two, my least favorite chore of the day is dishes. It could be because I love to cook – and cook real food – so I dirty a lot of dishes. But the main reason is I haven’t had a dishwasher in my kitchen for the past three years. Three years of washing dishes seems like a long time. (One day I timed my dishwashing duties and it took an entire hour.) It now seems funny to me that a dishwasher once seemed like a necessity but is now a luxury. A very well-appreciated luxury. Someday my husband and I will add a dishwasher to our kitchen. But for now, I’ve accepted the fact that I need to wash dishes three times a day. 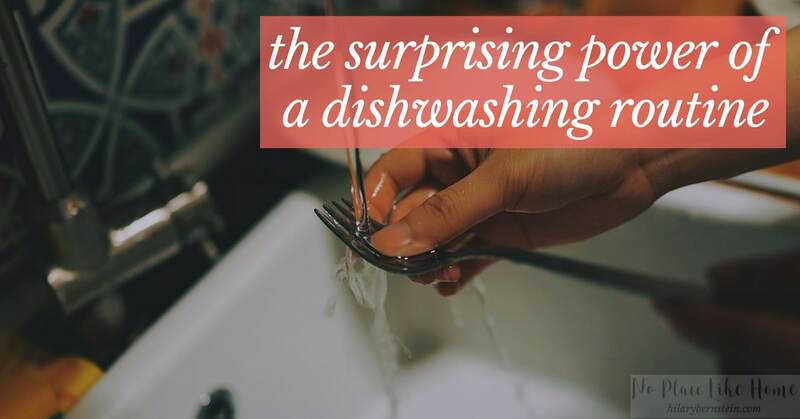 No matter if you have a dishwasher or wash your dishes by hand, it’s helpful to have a daily dishwashing routine so you’re not stuck with a sink full of dirty dishes covered in dried on, caked on food. In fact, dishwashing is one of my four Non-Negotiable Daily Chores. That means I know I have to wash dishes every single day, without fail. And that one chore makes all the difference in the cleanliness and manageability of my home. Wash your dishes when you’re finished with a meal. View dishes as part of your meal – the very final part. By thinking of clean-up as part of your meal, you’ll seamlessly clean your kitchen when you’re done eating and then can leave the kitchen and get on with life. Kitchen chores won’t cross your mind again. And that’s a good thing. If you’re blessed with a dishwasher, simply rinse your dishes (if that’s what you prefer) and load your dishwasher. If you don’t have a full load, don’t sweat it … shut the door and walk away. If you do have a full load, start your dishwasher and walk away, knowing that you’ll unload the clean dishes sometime before your next meal. If you wash your dishes by hand like me, wash everything after a meal. I don’t take the time to dry my dishes – I stick them on a dish drying rack and let them air dry. I absolutely hate the clutter of drying dishes on my countertop, but I’d rather see that than spend any extra time drying them by hand. Once your dishes are dry, put them away before your next meal. Regardless of how you wash your dishes, it’s important to put away clean dishes before your next meal so that you make room for another round of dirty dishes. Because, just like laundry, dirty dishes are a neverending task. There always will be more dirty dishes … so be prepared. 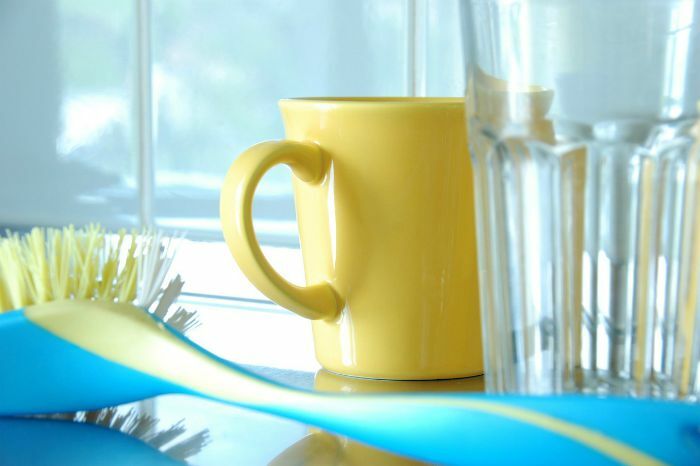 What dishwashing routine works best for you? Disclosure: This post originally was published on Sept. 16, 2015. Purchasing items through links in this post will result in a commission for No Place Like Home. Thank you for supporting this website!